Where You Get Answers You Can Trust! Dolan Insurance is a family owned and operated insurance agency, that delivers quality insurance solutions to individuals in Iowa. We specialize in Auto, Homeowners, Farm, Crop and Business Insurance coverage. 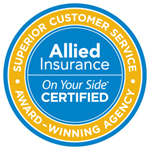 Our team of trusted insurance agents are committed to helping you find an insurance program that fits your needs. We focus on providing personalized attention and exceptional customer service. We believe our attention to detail sets us apart! At Dolan Insurance Agency, you will get answers you can trust. We proudly provide insurance solutions to clients throughout all of Iowa, including those near Manchester, Cedar Rapids, Waterloo Independence, Edgewood and Winthrop.